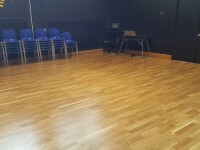 Services / facilities within the building include a theatre, box office, bar, a dance studio, drama studio and a green room. You are on Opening Times (Main Building). Skip to the next section. 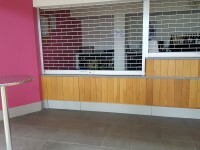 Please contact the venue for details of opening times, opening times do vary depending on performances and opening times do vary depending on timetabling. 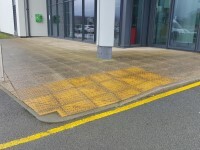 The dimensions of the designated parking bay(s) are 380cm x 470cm (12ft 6in x 15ft 5in). 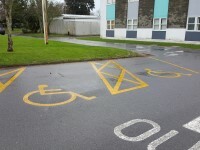 The furthest designated bay is 40m (43yd 2ft) from the main entrance. 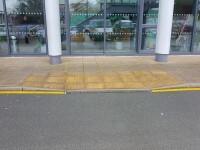 There are 2 separate dropped kerbs on route to building. 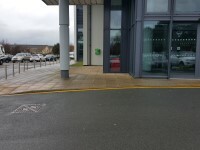 One dropped kerb is to the left of the entrance. 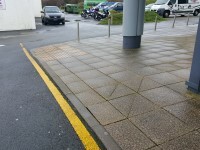 One dropped kerb is to the right of the entrance. 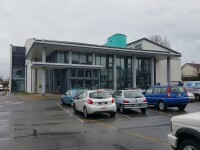 There is additional standard car parking to the left of the building as you face it. 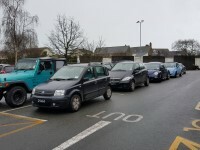 There are not designated Blue Badge bays in this car park. 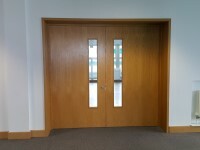 The door opening is 193cm (6ft 4in) wide. The door opening is 191cm (6ft 3in) wide. 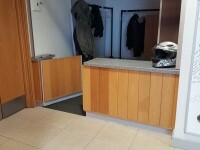 The desk is 7m (7yd 1ft) from the main entrance. 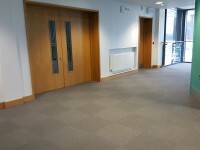 The desk is 13m (14yd 8in) from the main entrance. 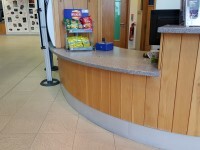 The reception desk is low (76cm or lower). Music/noise is played in the foyer. 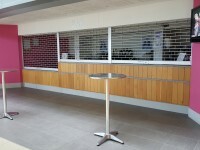 The bar is located on the ground floor, at the rear of reception. The nearest table is 3m (3yd 10in) from the main entrance. 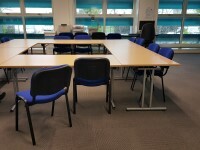 The distance between the floor and the highest table is 103cm (3ft 5in). 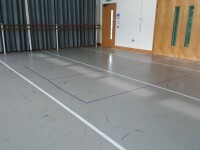 You are on Outside Access (Theatre Stalls). Skip to the next section. This information is for the entrance located on the ground floor, to the right of the theatre. There is a door leaf for both sets of doors. Once opened the door leaf increases the opening of both sets of doors to 121cm. There are similar doors to the left of the theatre. 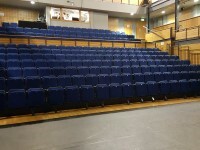 Designated seating is located the front row. 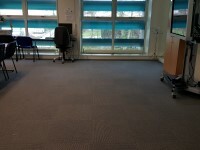 It is 14m (15yd 11in) from the designated seating area to the nearest accessible toilet. 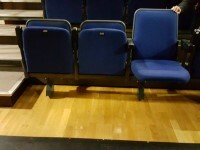 The seats are dropdown chairs. 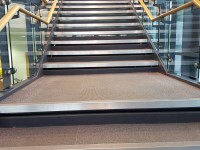 The step(s) is / are located to the left and right of the seating. 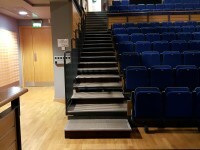 The steps surveyed were on the left hand side of the seating. 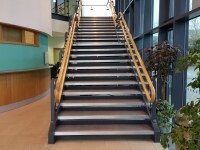 The steps on the right hand side have handrails on the right going up. You are on Outside Access (Dressing Room). Skip to the next section. 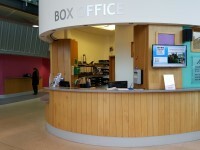 This information is for the entrance located along the ground floor right hand corridor, to the right of the theatre. You are on Inside Access (Dressing Room). Skip to the next section. You are on Dressing Room. Skip to the next section. There are 2 dressing rooms. The dressing room surveyed was Dressing Room 1. 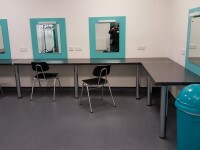 There are dressing tables around 3 walls of the dressing room. 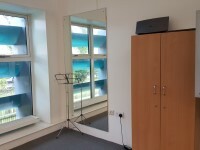 The height of the dressing tables is 75cm. 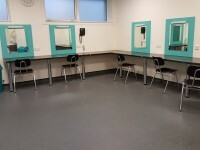 There are chairs in the dressing room. 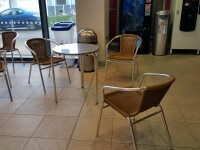 The chairs do not have armrests. There are mirrors in the dressing room. There are 2 full length mirrors. There are 6 make-up mirrors with lights. 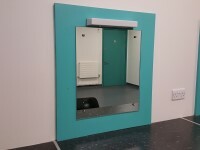 The mirrors are placed at lower level. The height of the lights is 148cm including the switch. 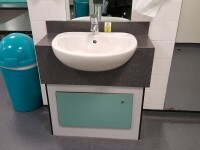 The height of the sink is 85cm. The sink has a mixer tap. The height of the towel dispenser is 117cm. 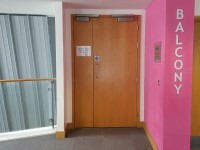 The lift is located in the central foyer, behind the box office. The lift is 12m (13yd 4in) from the main entrance. 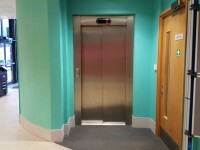 The dimensions of the lift are 108cm x 140cm (3ft 7in x 4ft 7in). 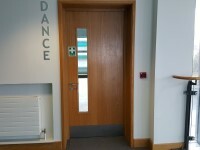 You are on Outside Access (Dance Studio). Skip to the next section. This information is for the entrance located on the first floor, to the right as you exit the lift. 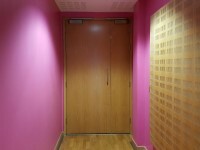 The door opening is 207cm (6ft 9in) wide. 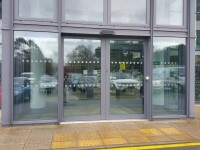 There is a smaller door to the right of the double doors. The width of this door is 87cm. 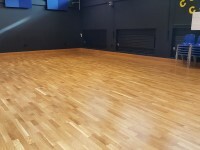 You are on Inside Access (Dance Studio). Skip to the next section. 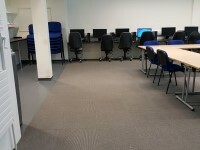 Music/noise is played during classes. You are on Outside Access (Theatre Balcony). Skip to the next section. This information is for the entrance located on the first floor, ahead as you exit the lift. Once opened the door leaf for both sets of doors increases the width to 121cm. 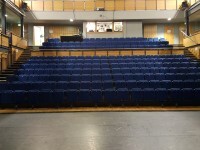 The balcony doors surveyed were on the right hand side of the auditorium. 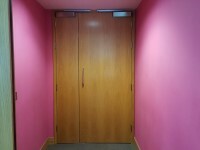 There are also similar doors on the left hand side of the auditorium. 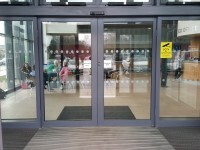 You are on Outside Access (Drama Studio). Skip to the next section. There is a door leaf. Once opened this increases the door opening to 132cm. 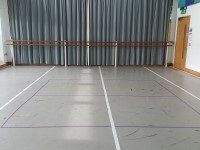 There are similar doors to the left and the right of the drama studio. They have the same measurements, but with the door leaf reversed. 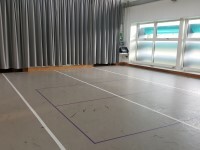 You are on Inside Access (Drama Studio). Skip to the next section. 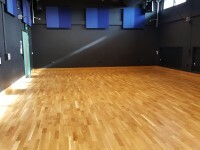 Music/noise is played during some classes. You are on Outside Access (Green Room). Skip to the next section. 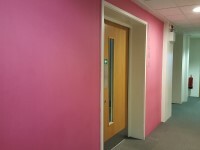 This information is for the entrance located to the rear right of the first floor. You are on Inside Access (Green Room). Skip to the next section. You are on Green Room. Skip to the next section. There are tables and seating in the green room. 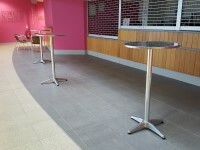 The height of the tables is 72cm. There are not chairs with armrests. 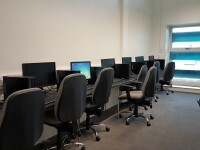 There are workstations with computers along one wall. The height of the workstations is 73cm. 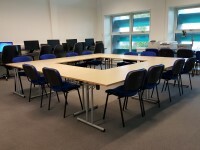 The computer chairs are height adjustable. 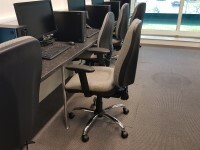 Some of the computer chairs have armrests. 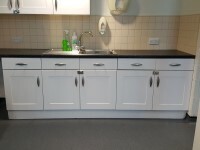 There is a kitchen area. There are no low level work units in the kitchen. The height of the work units is 93cm. 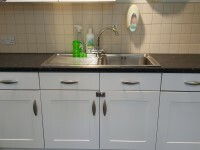 The height of the sink is 93cm. There is a full length mirror. 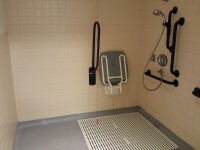 You are on Accessible Shower (Dressing Room). Skip to the next section. 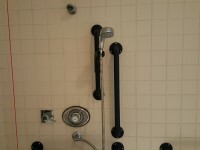 The showers are located in the dressing room. 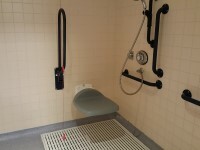 The facilities available in the accessible shower are an adjustable shower head, handrails and a flip down seat. The height of the seat is 46cm (1ft 6in). 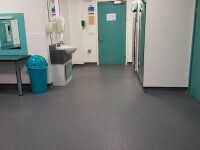 Other facilities available are an emergency alarm. The emergency alarm is not fully functional as it is 19cm from the ground. 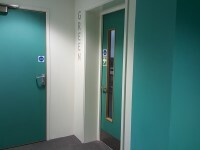 There is Braille , tactile, pictorial and written text signage on or near the toilet door. 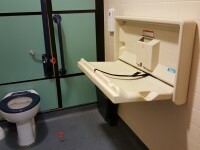 This accessible toilet is 14m (15yd 11in) from the main entrance. 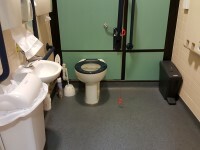 This accessible toilet is located to the rear of the foyer behind the box office. 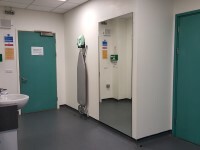 The dimensions of the accessible toilet are 150cm x 192cm (4ft 11in x 6ft 4in). The towel dispenser is 107cm (3ft 6in) high. 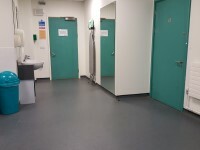 There is a similar accessible toilet in the back of house area on the ground floor. The back of house accessible toilet has transfer space on the opposite side. 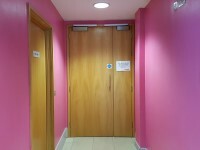 The female and male toilets are located to the rear of the foyer behind the box office. 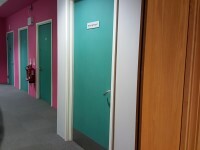 The female and male toilets are 14m (15yd 11in) from the main entrance. 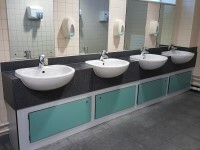 The end cubicles have doors which open outwards for ease of access should patrons require assistance. There are similar standard toilets in the back of house area on the ground floor. The back of house area standard toilets are unisex. 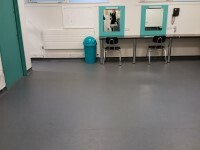 The assistance dog toilet area is located in the area surrounding the venue.